Poop Happens Kid T-Shirt Discounts Apply ! 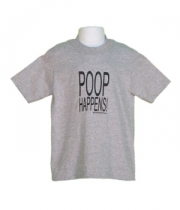 Poop Happens is the cutest t-shirt for little kids that I've seen in a long time. Available in white or gray and sizes 6 mos, 18 mos, and Youth XS (2-4).